Business has been slow for Josue Peley. On Saturday, it was quick. Before the season, Major League Baseball decreed that every team must hire a Spanish-to-English translator to facilitate media interviews. The Blue Jays picked Peley. But the only Blue Jay requiring his services is Ezequiel Carrera, who spends most games on the bench. Entering Saturday’s game against the red-hot Oakland A’s, Carrera had three hits in 17 at-bats. The previous night, his egregious misplay of a single in left field had helped the A’s pad their lead in the Jays’ third straight loss. On Saturday, in Toronto’s 9-3 win, Carrera morphed into a hero for a day: three singles, a double, a stolen base and two dazzling, diving catches in the left-centre field alley. On the second catch, the capacity crowd stood and cheered, and just when they were ready to sit down, they saw the replay on the scoreboard, and they were up and yelling again. “One of my best games I ever played in my life,” said Carrera, through Peley, in the first scrum of the season for both of them. That, for Carrera, Peley and the media, was pretty much it. But Carrera, filling in for the hamstrung Michael Saunders, was an improbable catalyst atop the lineup. And for the previously bedraggled Blue Jays, the game was full of encouraging signs: two long home runs for Troy Tulowitzki, the focus of much fan fretting because of his 9-for-60 start; another nice outing for left-hander J.A. Happ, who allowed three runs in seven innings; and a homer and two singles from Josh Donaldson, who acknowledged that he was sorely annoyed when former teammate Liam Hendricks drilled him with a pitch in the sixth inning. Donaldson gave Hendriks a most valuable glare. “I don’t like getting hit, so it does piss me off a little bit, I’m not going to lie,” he said calmly during a post-game media session. This was one game among 19, and the Jays are still a game below .500, and their hitters continue strike out at a ferocious pace. But nine runs? That’s the most they’ve managed in one game since last Sept. 15. “Today was more Toronto Blue Jays’ offence-like than what we’ve seen early on in the season,” Donaldson said. The defence was Jays’ defence-like, turning three double plays behind Happ. Easily overlooked reliever Gavin Floyd (2.16 ERA in six games) set down the last six A’s in order, aided by Carrera’s second Web Gem. Carrera’s defence is occasionally best viewed through closed fists. 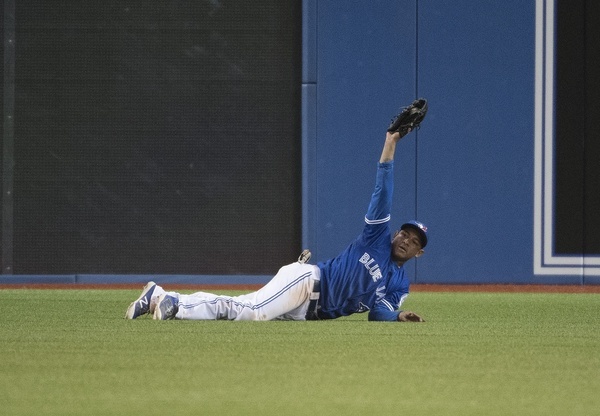 Last year, as manager John Gibbons politely pointed out, Carrera had a habit of diving for balls and missing them, or catching them and letting them bounce out of his glove when he hit the ground. Gibbons likened those pratfalls to a sound. A “dink,” he called it. Now that Carrera has corrected that dink, and showcased his bat and his speed as well against the A’s, he has earned another start on Sunday. Gibbons said he will ride the hot hand and give Saunders another day to calm his capricious hamstring. Tulowitzki, who shed a gorilla from his back with those two bombs to centre field, praised Carrera’s work and observed that the Jays will need more good games from the reserve corps. Tulowitzki had been been given a day off on Friday because, Gibbons said, his shortstop had a sore hip from diving for a ball Thursday. Tulowitzki said he appreciated the respite, but felt it had nothing to do with his health. So, for a change, was everybody else. “We had been grinding a little bit so it was definitely good to see some smiles on some guys’ faces,” Tulowitzki said. At the end of Carrera’s brief scrum, someone reminded him of that sensational catch he made in Yankee Stadium in 2014 that stole an extra-base from Jacoby Ellsbury. The play made the highlight reels “forever,” Gibbons said. Gotta say, between John Lott, Stacey May, Stoeten and Lewis with the wknd game-threat, the quality of baseball content at times around here is kind of astounding. Now that I’ve seen Gibbs refer to Carrera as “Zeke”, we can all feel comfortable calling him Zeke. Eat it, Stoeten. I’m dumb, but I’m not stupid.